Dave the boss loves an auction, the chance to snap up something truly amazing, truly unique and sometimes utterly pointless (but it keeps him happy ). Our shop fittings come from Dave's auction trips, and to be fair he's a got a good eye. But sometimes he buys something that defies logic. About a year ago Dave's spotted a unique auction of the works of “Airartists” the studio that produced huge oversize inflatables for the likes of Pink Floyd , Queen and even Roy Chubby Brown. Four lots had caught Daves unique eye prior to the auction and boom he was gone. 1/ , The infamous Pink Floyd inflatable pig “Algie” that once unlatched itself from its moorings about Battersea power station floated over to Heathrow and grounded all incoming air traffic. Sadly for Dave and luckily for Rotherham this lot was withdrawn just prior to auction when Pink Floyd bought it for themselves . The Space Chicken is On-One's Monster Gravel bike, a versatile big wheeler that can run 700c or 650b wheels with tyres up to 48mm. 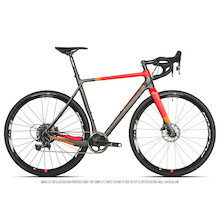 Kitted out with Reverb Stealth routing, thru-axle dropouts and built to take a single front ring between 28-48 it's part gravel bike, part tourer, part cyclocross and all fun. It's a true monster. While the Space Chicken's name might not make any sense everything else about it makes perfect sense. Built for adventurous riders who want to tackle any trail and explore the backcountry under their own steam the Space Chicken is equipped for the long haul. 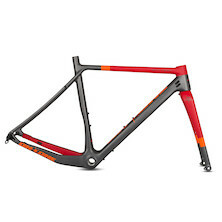 Handbuilt from IM carbon it's surprisingly lightweight, especially if you're coming from steel or titanium frames. With thru axles, disk brakes, Stealth Dropper routing, internal cable routing, 3 bottle mounts, rear pannier mounts and space for full mudguards we've included all the details that any adventurer could need. What you don't see on the inside is just as important as what's on the outside and that's why you'll find extra layers of carbon on the seat-tube and top-tube to help support the weight of your bike packs. An extra bottle cage on the downtube helps you carry enough liquid for the long haul. The Space Chicken's versatility works hand in hand with our carefully developed frame geometry. Swapping between 650b/700c wheels isn't an issue, ride whatever you fancy. With space for 650b tyres up to 48mm, you can choose wheels to match the conditions. We've included a dropped RHS chainstay to help clear wider tyres and offer more space for bigger chainrings. Whether you're a beast looking to run a 48t front ring for fast CX riding or a serious diesel engine who'll grind out the miles with fully loaded panniers and bike packs on a 28t the Space Chicken is for you. Monster Gravel, touring, cyclocross, big wheels, big tyres, huge load carrying ability, built for 1X drivetrains, dropper seat post ready and kitted with flat mount disk brakes the Space Chicken is ready for anything- are you?